Japan is a country deeply steeped in tradition and culture and prides itself in portraying them at several functions every year, to which foreign residents are warmly invited and welcomed. Equally, the Japanese have a keen interest in the traditions, cultures and food of other people and enjoy cultural events held with them immensely. Every year the Kenyan diplomats attend such events and the Embassy hosts others in a cultural exchange that helps foster greater understanding between Kenya and Japan and builds stronger bilateral relations. The Embassy also actively promotes Kenya's culture through publicizing Kenya's cuisine, music and dance in the media (electronic and print) and at annual festivals and events in which the Embassy participates in or hosts. These events are held in diverse locations (parks, clubs, schools, the Embassy's hall and at colleges) and involve all members of the Embassy. 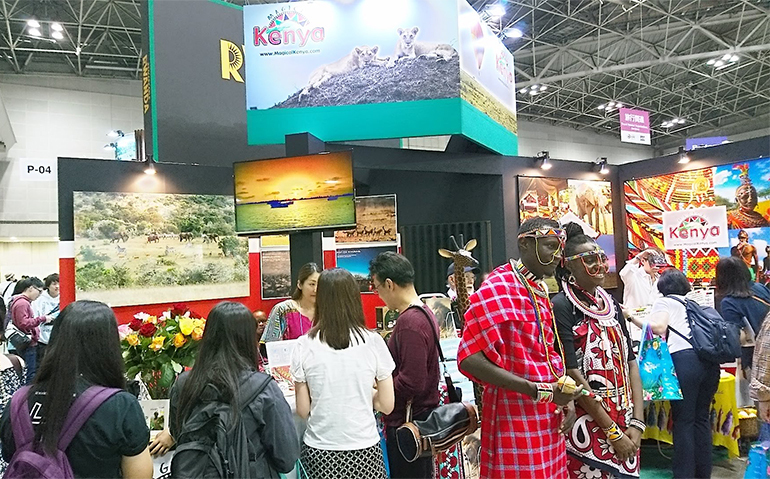 The Embassy always serves Kenyan cuisine and provides lectures and demonstrations at all trade and tourism seminars that are regularly held in the Embassy Hall by Japanese companies selling Kenyan products. The Embassy's efforts in Cultural Exchange have proved popular and are drawing growing participation, especially in Tokyo. The Embassy participates regularly in Fairs and Exhibitions between April and October to promote our main exports of tea, coffee, cut flowers and macadamia nuts. This has proved to be a cost effective way of reaching out to the Japanese public as well as wholesalers and retailers who supply these products to the market. The Embassy plays a central role by supporting these companies through provision of vital information and negotiations with home companies, Government Ministries and institutions. As well as facilitating match making between Kenyan and Japanese companies. In 2003 the Embassy, in conjunction with Japan External trade Organization(JETRO), facilitated a tea research project whose findings are still being implemented. Further, every year the Embassy organises and participates in trade fairs as well as holding tea seminars at the Embassy hall in collaboration with Japan tea Association. Having achieved such spectacular success in the Asian Tigers of South East Asia, Japan's Minsitry of Trade and Industry in promoting Kenya as an investment destination based on its strategic location, abundant and well educated workforce, and membership of regional economic blocks (COMESA, EAC, NEPAD, AGOA, etc.). Recently the focus is on reaching out to the medium size private companies that traditionally rarely considered expanding abroad, but because of their size consider the relatively smaller African markets attractive. Though UNIDO (United Nation Industrial Development Organization), the Embassy arranged for an officer of the Kenya Investment Authority to travel to Japan to promote our foreign investment climate and seek technology transfer for Kenya. The officer undertook a three-week programme which also provided an opportunity to get acquainted with the Japanese investment and business culture and the organizations involved in assisting investors. The Embassy has also led in the African Diplomatic Corps' initiatives to attract attention to Africa. Such initiatives include hosting the Bio-fuel forums, investment seminars in collaboration with Japanese companies and meetings with promoters of CDM ( Clean Development Mechanism) projects. The Embassy regularly facilitates companies travelling to Kenya to seek investment opportunities by arranging meetings with key stakeholders, with the assistance of the Kenya Investment Authority. Japan is a sporting country and has awarded a number of sports scholarships at both junior high school and university level to top Kenyan athletes who have also jointed top companies like Toyota, Hitachi, Nissan, Hitachi Cable, Panasonic and Daihatsu among others. Top ranked sportsmen like Douglas Wakihuri, Stephen Mayaka, Daniel Njenga, Eric Wainaina, the late Joseph Otwori, Philip Mosima, Esther Wanjiru, Ann Wamuchii, Philis Ongori and Everlyne Wambui among others have all made Kenya proud through their victorious wins. The Embassy supports all our athletes in Japan by ensuring their terms of contracts and welfare are not violated. Through this close liaison, the embassy has been able to monitor the progress and growth of our sportsmen. It has always been a moment of great national pride to see Kenya showered with accolades among the Japanese people for sporting supremacy.